Comes with laser-cut fins and bolt plates, decals and 18" pre-assembled parachute. Includes colorful instructions, tubes to make recessed and protruded details, a single-piece antenna coupler. * Remove 2 seconds off the 7 second version of this reload. The Sandia Corporation did research for the Atomic Energy Commission in the 1950's to develop nuclear weapons. The Sandhawk was one of the rockets used for this research. 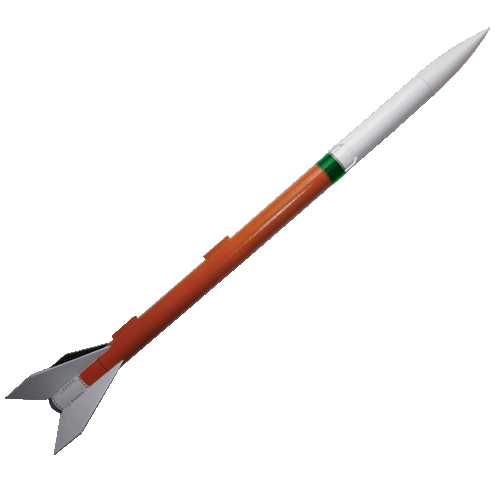 It was flown in single stage and two-stage configurations. This is the single stage version. A mid-power rocket for super-sized fun!